Ever since the 2010 parliamentary elections Hungary has set off on the journey to became an ‘illiberal’ member state of the EU, which does not comply with the shared values of rule of law and democracy, the ‘basic structure’ of Europe. The new government of Viktor Orbán from the very beginning has justified the non-compliance by referring to national sovereignty, (even using the absurd argument that “We won’t be a colony anymore”), and lately to the country’s constitutional identity guaranteed in Article 4 (2) TEU. This constitutional battle started with an invalid anti-migrant referendum on 2 October 2016 [i], was followed by the failed Seventh Amendment to Fidesz’ 2011 Fundamental Law on 8 November 2016 [ii], and concluded in early December last year by a decision of the Constitutional Court, in which the packed body in a binding constitutional interpretation rubber stamped the constitutional identity defense of the Orbán-government. After the failed constitutional amendment, the Constitutional Court, loyal to the government came to rescue Orbán’s constitutional identity defense of its policies on migration, and everywhere where it may disagree with the EU. The Court carved out an abandoned petition of the also loyal Commissioner for Fundamental Rights, filed a year earlier, before the referendum was initiated. In his motion the ombudsman asked the Court to deliver an abstract constitutional interpretation in connection with the European Council decision 2015/1601 of 22 September 2015 [iii]. The Court in its decision 22/2016 (XII. 5.) AB – relying on the German Federal Constitutional Court’s methods of constitutional review of EU law – developed a fundamental rights review and an ultra vires review, the latter composed of a sovereignty review and an identity review. The Court holds that the constitutional (self-)identity of Hungary is a fundamental value that has not been created but only recognised by the Fundamental Law and, therefore, it cannot be renounced by an international treaty. The defense of the constitutional (self-)identity of Hungary is the task of the Constitutional Court as long as Hungary has sovereignty. Because sovereignty and constitutional identity assorts in many points, therefore the two reviews need to be employed considering one another. Although there is no strict and exhaustive list of constitutional identity-sensitive matters excepted by the ECJ, but taking into account the jurisprudence of the Court there are more frequently acknowledged issues, such as decisions on family law, the form of State, foreign and military policy, and protection of the national language. 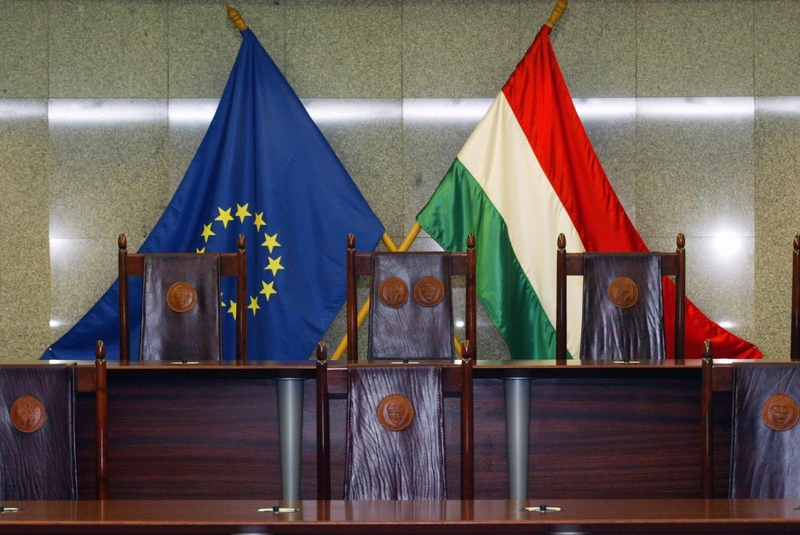 [viii] The subject matter of the Hungarian Constitutional Court decision was the quota decision of the European Council, based on which 1294 asylum seekers would be located from Greece and Italy to Hungary and the Hungarian authorities would be obliged to process their asylum application. What interests of the society can legitimately trump the international obligation here? The will of the government not to have any refugees, [ix] even if supported by 3.3 million voters during the invalid referendum, is certainly contradicts the requirement of sincere cooperation of Article 4(3) TEU. And whose ‘human dignity and other fundamental rights cannot be renounced’ by the Court? The only rights, which need ‘ultima ratio defense’ here, are those of the migrants’ and refugees’, but their rights will be ignored if Hungary exempts from the quota decision, and any other solution of the refugee and migrant crisis. In other words, the references to the Solange jurisprudence of the German Federal Constitution are misleading, because the German Court’s invocation of constitutional identity aims at promoting higher standards that the EU law requires, while the Hungarian judges reference serves to lower the standards of fundamental rights protection. Posted with kind permission from Verfassungsblog.de. [v] Independently from this procedure, the Hungarian government, right after its Slovakian counterparts’ submission also challenged the quota decision before the European Court of Justice. This procedure is still pending, but the ECJ in its decision won’t take into account neither the text of the Hungarian constitution, nor the domestically binding interpretation of it by the Constitutional Court. [vi] Case C-208/09, Sayn-Wittgenstein, para 86. [vii] See for instance Case C-135/08, Janko Rottmann (2009) OJ C 113, 1.5.2010. [viii] See these matters mentioned in P. Faraguna, ’Taking Constitutional Identities Away from the Courts’, Brook. J. Int’l L. Vol. 41:2. 2016. 491, at 506-508. [ix] In May 2015, a few days after many hundreds of refugees have drowned in the Mediterranean Viktor Orbán announced that ‘We need no refugees’. [x] Some critics of the historical constitution even raise the possibility that the Court might consider the Hungarian Jewish laws, first of such acts in Europe as part of it. [xi] See I. Császár, B. Majtényi, ’Hungary: The Historic Constitution as the Place of Memory’, M. Suksi, K. Agapiou-Josephides, J-P. Lehners, M. Nowak (eds.) First Fundamental Rights Documents in Europe, Cambridge: Intersentia, 2015. 57-69.